With China implementing a new round of basic education curriculum reform, environmental education has come under focus for primary and secondary schools. As part of this curriculum reform, a number of primary and secondary schools have applied their attention to urban wetlands as important sites for environmental education, school-based curriculum development, and meaningful learning experiences. However, little is known about how formal learning in urban wetlands activates children’s environmental awareness and sense of place, or cultivates children’s environmental literacy in the Anthropocene. To address this knowledge gap, we set the context for Chinese curriculum reform and describe urban wetland-based environmental education in China. We argue that environmental education is an indispensable part of China’s curriculum reform and provides a source and power for reform. We draw on two case-studies to show the process and features of urban wetland-based environmental education within school-based curriculum development. School-based urban wetland environmental education can be an effective way to improve Chinese school children’s childhoodnature in Anthropocene times. This chapter not only aids in better understanding the place and meaning of urban wetlands-based environmental education in Chinese schools but also the role of environmental education in curriculum reform in primary and secondary education in China. The rapid development of China has been a prominent feature of the twenty-first century. As a part of counter-strategies for problems arising from great and rapid development, China has paid more attention to the benefits of environmental education. From the eighth curriculum reform for basic education in 1999, environmental education has been specially highlighted within formal Chinese curriculum. A symbolic policy document, Implementation Guidelines for Environmental Education in Primary and Middle Schools, was produced by the Ministry of Education in 2003. It was the first national-level curriculum guidance document for environmental education in formal education. According to the Guidelines, the schools are strongly encouraged to promote environmental education by taking advantage of surrounding environments and local natural sites and developing school-based curriculum for local environmental learning. Urban wetlands serve as an important site for environmental education. In the context of curriculum reform, schools in Bejing, Harbin, Hengshui, Shenzhen, and other cities have developed school-based curriculum for their local wetlands to promote environmental education. In this chapter, we focus on case studies from two schools in Bejing, a primary school and a secondary school, to explore the intersection of urban wetland-based environmental education, school-based curriculum development, and Chinese school children’s experience of nature in times of very rapid environmental change. We begin by setting out the context for environmental education and curriculum development in China as a response to the Anthropocene, and review what is known about environmental education in China in relation to children’s nature learning. This chapter will not only help us better understand the role of urban wetlands-based environmental education in Chinese schools but also the role of environmental education in curriculum reform in primary and secondary education in China. One of the most prominent features of the Anthropocene has been the rapid development trajectories that have emerged in the world’s largest developing countries, most prominently China (Steffen, Grinevald, Crutzen, & McNeill, 2011). China has recently entered another period of economic take-off – a great “revolution” without a parallel in the history of the human world. But this “revolution” throws a dense shadow on China’s capacities for sustainable development. Losses from pollution and ecological damage range from 7% to 20% of China’s GDP every year in the past two decades, and continuously emerging new problems become great threats for the nation and its people. Such problems affect not only China but the world. Political leaders promised that the Chinese government would lead China to build a sustainable country in this Anthropocene time. Obviously, this commitment, if it is a real commitment, means a overwhelming duty and foreseeable huge amount of effort. The scope of China’s environmental problems is complex, involving poverty, culture, and political situations, as well as technical, social, and economic development conditions. With a current population over 1.410 billion (20% of the world’s human population) and relatively low economic, scientific, and technical capabilities, China’s socioeconomic development before 1978 was difficult and inefficient. Industries did not adhere to a standard of environmental performance, and environmental agencies lacked sufficient funds and authority to enforce environmental regulations. Since 1978, especially since 1986, China has showed vigorous economic growth unmatched elsewhere in the world. China’s swift economic growth over the past three decades has been delivering to its people a relative prosperity that is largely defined in immediate material terms. But China’s economic prosperity is taking place at great cost to China’s environmental quality and natural resources. China’s rivers, reservoirs, and other water resources are largely contaminated. Cities are the engines of economic growth. Unfortunately, cities in China are facing expanding pollution problems, with urban air laden with harmful particulates, gases, and toxins; solid and hazardous wastes often dumped untreated; and pollution extending from urban areas to rural areas. Environmental pollution is affecting overall social and economic development. Environmental problems are exacerbated by mismanagement, carelessness, indifference, ignorance, as well as a lack of measurement and monitoring methods to provide baseline data critical to serve as a technical basis for planning and design to prevent and control pollution, and as verification of adverse effects on health and the environment. A lack of information sharing has led local governments to misinterpret laws and regulations. Moreover, institutional obstacles within the government and legal systems have contributed to unequal distribution of information on laws, regulations, and enforcement mechanisms. Without proper knowledge and information, local governments and the people cannot implement environmental regulations effectively. As one consequence of rapid development, urban areas have expanded rapidly and millions of people have migrated into cities. Sixty percent of the human population now lives in cities, meaning more than 250 million children under the age of 14 live in urbanized areas. As Noschis (1994) suggested, densely populated cities have become the “natural environments” for children, as well as rich learning environments, whether or not formal places for children are intended, planned, or otherwise. 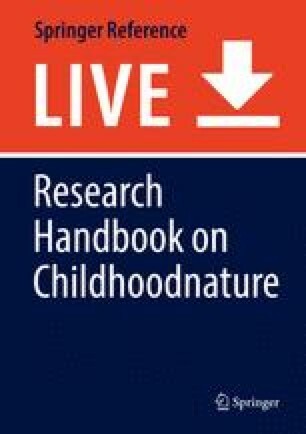 Chawla (1995, p. 11) writes that “Western culture has historically separated notions of nature and the city, and since the eighteenth century, it has associated children with nature” and in China, too, separation between a designated nature (natural space) and city children deemed a cause for a so-called nature deficiency. Steffen et al. (2011) argued that humanity is now entering stage 3 of the Anthropocene based on the growing awareness of human impact on the environment at the global scale and the first attempts to build global governance systems to manage humanity’s relationship with the Earth System. The Chinese Government has set “invigorating China by means of science and technology” and “sustainable development” as the fundamental state policies since the late 1990s. In January 1999, the Education Promotion Plan of Action for the 21st Century (Ministry of Education, 1998) was approved by the State Council to the Ministry of Education, marking the beginning of education curriculum reform. The 10-year Plan was to implement a “cross-century quality education project” to improve the quality of state education, comprehensively improve national innovation capability, reform the curriculum and evaluation system, and formulate a standard of contemporary education curriculum in 2000. The Plan reformed educational content and teaching methods. In June 2001, the Ministry of Education released the Master Plan of Basic Education Curriculum Reform [Trial] (Ministry of Education, 2001), which officially meant the new round of Chinese basic education curriculum reform (hereinafter referred to as the new curriculum reform) was in full swing. Part of this Plan is to improve students’ sense of social responsibility and environmental awareness as a part of civic moral literacy. New curriculum reform was adopted by all primary and junior high schools (middle schools) in more than 30 Provinces covering the 9 years of compulsory education. As, such, this curriculum reform has become a normal state for Chinese education today. In 1999, the Ministry of Education proposed that environmental education should be formally incorporated into primary and secondary schools as an interdisciplinary theme. In March 2003, the Ministry of Education introduced the Primary and Secondary Students’ Environmental Education Syllabus (Ministry of Education, 2003a), requiring all schools to teach environmental education. In October, the same year, The Guidelines for Implementing Environmental Education in Primary and Secondary Schools [Trial] was published by the Ministry of Education, which marks the legalization and standardization of environmental education in Chinese schools (Ministry of Education, 2003b). The Guidelines guarantee that environmental education will be operationalized to cultivate the sustainable development awareness and educate for a rational concept of population, environment, and development. Students are encouraged to learn about environmental issues from an early age and work together to create a sustainable future. These two Ministry of Education documents mean that environmental education is officially manifest in basic education in China and the legitimacy of environmental education has been established for 15 years in formal state schooling. Educators were encouraged to combine environmental education with pedagogy reform and recognize participatory and exploratory teaching methods as the contribution brought by environmental education into general curriculum reform. The Guidelines is China’s first environmental education document at national level, a true milestone benefitting hundreds of millions of primary and secondary students, who receive quality environmental education, not only for the protection of nature but also to enhance their confidence and capacity to build a sustainable future as world citizens with a sense of responsibility towards their environment and society. The Guidelines put forward a “learning from practice” model, as stated in the Part IV of the Master Plan of Basic Education Curriculum Reform [Trial], the purpose of which is “to create educational environment where students can participate actively, stimulating their learning enthusiasm and developing their ability to use knowledge in the real situation, so that each student can be fully developed.” The later National Environmental Education Action Plan (2016–2020), issued by Chinese Ministry of Environmental Protection in 2016, explains that “primary and secondary schools should include knowledge of environmental protection and ecological civilization into curriculum, through strengthening teacher training and developing teaching materials” and putting effort into environmental education extracurricular events. “Activity-based teaching and learning” (ABTL) has its roots in a historical, naturalist educational tradition of Plato and Rousseau, Dewey’s empiricist educational theory, and Piagetian cognitive psychology (Kin-Lee, Yu, & Ma, 2010). ABTL now can be considered a contemporary type of experience learning developed in China corresponding to international teaching methods, and having similarity with inquiry learning and project-based learning, promoting student-centered activities, and experiential learning as a unique dimension of environmental education. The original, centralized curriculum has been greatly adjusted by recent curriculum reform, by way of putting forward a three-tier system: the national curriculum, local curriculum, and school-based curriculum, enables the expansion and development of local scale curriculum resources. Research indicates using local natural environments as a curriculum resource and as a site for learning can effectively solve a nature deficiency syndrome (Huang & Xie, 2017), stimulate learning interest, enhancing student knowledge of nature, promote scientific experience, cultivate a kind heart and the spirit of exploration, enhance teamwork, purify the mind, promote moral sense, and develop the ability of artistic creation. Current cases show that “adapting to the local conditions” has become an important feature of curriculum reform, especially the school-based curriculum, which can integrate teaching and learning for local environmental situations into school curriculum, and present a real opportunity for environmental education to perform innovatively (Liu & Huang, 2013). Urban wetland can be seen as one of the symbols of the Anthropocene – the human imprint on the natural environment, a mix of city and nature. Urban wetlands are ecosystems located within a city and are half land and half water (Zhang, Li, Liu, & Zhu, 2016). Urban wetlands have prominent leisure and educational functions, and while profoundly influenced by human activities, they keep an intimate relationship with human beings. The types of urban wetlands in urban China include lakes, rivers, swamps, ponds, reservoirs, ditches, canals, and urban coastal wetlands (Liu, Lin, Wang, Yin, & Guo, 2013). Empirical studies have shown the importance of using natural experience as an educational method (Huang, 2017). The Guidelines encourage schools to use sites such as wetlands to carry out environmental education. There are different types of urban wetlands in the cities of China; some have been developed into city wetland parks. On the one hand, urban wetlands are rich in water, animals, and plants and are resource sites for environmental education. On the other hand, compared with natural wetlands and wetland nature reserves, urban wetlands are able to be equipped with more educational facilities, and they are accessible by transportation and are considered to excellent sites for primary and secondary schools to carry out environmental education. Cultivating children’s sense of loving and protecting their environment from an early age is a basic principle for implementing environmental education in China, as an old proverb says “Habit is a second nature” (Du, 2011). Nature can be seen as the second classroom because it will help students directly develop their environmental knowledge much better. The unique ecological environment of the wetland provides opportunity to take a close look at wetland scenery including its plants and animals in relaxation, so as to further have willing to protect it (Li, Cui, Dong, Zang, & Wei, 2014). Educating children according to their nature is also an ancient wisdom of China, the so-called Dao models itself after nature. The early stage of youth is also the time when children are full of curiosity toward the nature, so it is the perfect time to help them build the bridge with nature by engaging in activities related to nature, which will improve their perception towards it and local sense of belonging (Table 1). A number of noteworthy cases on wetlands as education sites include the study of the history and culture of the moat in Dongzhimen Middle School in Beijing (Zhu, 2007); the study of algae and birds in Taoranting waters by No.15 secondary school (Lu & Wang, 2004); student research in Jiaozhou Bay wetland in Shandong Province by College Road Primary School. In the following two cases, we analyze school-based environmental education using urban wetlands as learning site. Ya’er Hutong Primary School is located in the Xicheng District of Beijing Shi Cha Hai north shore, only a few steps away from the Shi Cha Hai wetland at the center district of Beijing city. The school is located in the old city known as Hutong landscape and surrounded by former residence of celebrities, historic relics, courtyards, and many other attractions filled with typical Beijing characteristics. Using Shichahai wetland as a learning site, the school has carried out a distinctive school-based environmental education since 2001. The school first organized all the teachers to participate in seminars and training to arrive at a unified understanding of the principles of curriculum reform and means to develop school-based curriculum. Subsequently, the school set up a school-based curriculum leading group headed by the Principal to help teachers design programs around improving environmental awareness and cultivating environmental literacy through enriched engagement programs that included classroom teaching, regular school rallies, extracurricular activities, the Young Pioneers events, community services, and cooperating with family members. The curriculum design team decided to use current teaching material and local sources to design courses at three levels: low, medium, and high, according to students’ grades. Students in low grade mainly need to understand simple environmental knowledge; at medium level, the education aim is to form students’ sense of protection and initiative to act; at the highest level, curriculum design is to enable students to take action within their ability. This means that the key to effective and meaningful curriculum is teachers. Through seminar system every 2 weeks, teachers exchange opinions with their colleague and reach a consensus. Data collection and evidence-based practice is emphasized as school-based curriculum is developed. Activities are designed for student exploration, respectively, the school-loving education based on school history, the patriotism education based on surrounding former residence of celebrities and garrison, the social education based on community research and service, the history education based on surrounding monuments, and environmental education conducted in the famous, local wetland. The Shi Cha Hai wetland includes the calm lake and has become a well-known place for leisure and student investigations have raised various questions about the impact of such changes of land use on the water quality and daily life of residents in this area, reporting their findings to the local Chamber of Commerce. These curriculum practices have had a very positive effect. A survey of students conducted by external observers in 2008 and 2013 showed that students had a high degree of satisfaction with the “activities” in the school-based curriculum, believing that their development of intelligence and ability in the course of activities was much greater than that achieved through more traditional pedagogy. Teachers think that school-based curriculum promotes the improvement of students’ overall quality, which manifests through improved student confidence, braveness, and problem-solving abilities. As showed in the interviews with teachers and the principle, school-based curriculum serves as an effective way to widening teachers’ horizon, contributing to their transformation of education idea, and also, teaching ability has been improved into a new level (EIWPT, 2008; Liu & Huang, 2013). The High School affiliated to Beijing Institute of Technology was constructed in 1950 at the south bank of the Long River, which is an important part of Beijing’s urban wetland system. Since 2001, the school has developed school-based environmental education curriculum, using the Long River as a learning site, drawing on forms of project-based learning embedded in an integrated practice activities learning module. The first curriculum stage is to set up the concept of the purpose of “love water” activity to encourage interested students to participate. Establishing “water-loving” student groups carry out many projects, such as investigating water usage of their school and family, making a “water-loving convention,” publicizing knowledge in the local community, visiting water saving pavilions in Beijing, posting water-saving proposals on the school’s official website to effectively spread the importance of “water-loving” as a key concept in environmental education in the school. So successful is this concept, that “water-loving” activities have become famous brand of the school, serving as an important role in motivating students’ exploring interest and inquiring desire, which lay further foundations for more activities. “Loving the Long River” concept promotes water knowledge, water conservation, and water appreciation and is instrumental forming a water-loving atmosphere within the whole school, which is distinctive of this high school’s identity. Experiential learning activities enable students to research their local water area (the river and their water supply) under teachers’ guidance and then devise actions for care of Long River. After a preliminary investigation and analysis, students identified projects such as the Long River water environment survey, the Long River lawn growth status research, the efficiency of Long River lawn watering facilities, and the investigation of Long River branch as some examples. Students groups conduct research in geography, biology, chemistry, physics using established scientific techniques; design plans and choose research methods; allocate and self-manage group tasks, rethink obstacles they encounter in breakthrough ways, and communicate with other groups and teachers. In the course of study, new problems and ideas have always been found, in which way students’ interest can been stimulated so that the entire research process is able to continue. Equally important is using information technology to record, express, and communicate students’ research process and results. With the help of a technology teacher, who is also a member of research group, files can be easily saved as an electronic document, all scanned and classified, numbered, and accompanied by instructions. These materials have become important teaching resources for information technology curriculum. For instance, students were taught making “water-loving” website using these materials and students from different grades have cooperated to designing “water-loving action” website, which is available on internet. Through this website, students can easily access and communicate their own research content, processes, and results. In this way, students are actively generating a wealth of curriculum resources for information technology class, while the latter serve as an effective media for the former as an integrated practice activity. The results of student inquiry also contribute to the evolving formation of school-based curriculum inclusive of the disciplines of history, geography, biology, art, and social studies. A survey of students conducted by external observers in 2008, 2013, and 2016 (EIWPT, 2008; Liu & Huang, 2013; Huang, 2017) also shows a high degree of satisfaction toward school-based curriculum in this school. The water-loving curriculum organizational concept has been very effective for learning environmental education with its focus on a key Beijing waterway. Through carefully designed curriculum and pedagogical processes, the students’ abilities to think independently have been cultivated and they show initiative to learn; teachers also update their education concepts, and enhance their ability to adapting to curriculum reform. This case has been widely recognized by experts (EIWPT, 2008). Using urban wetlands as sites and resources for environmental education does improve students’ thinking level, perception of nature, and sense of belonging. In participating in practical and investigative activities, students find their interest and become more confident. More importantly, these activities evoke students’ concerns about the environment and social issues and may have a profound positive impact on students’ future life and learning. Therefore, this kind of environmental education model using urban wetlands as learning site and school-based curriculum as curriculum carrier can be regarded as a successful exemplar of Chinese school environmental education. At present, environmental education is mandated to be widely carried out in primary and secondary schools in China, and since the start of this century, educators have accumulated a lot of experience, which contributes to the popularization of teaching and learning environmental knowledge and environmental awareness. China is facing an unprecedented opportunity to continually improve the quality of environmental education. As a country with a relatively backward education level, China can learn from all the forerunners’ sufficient experience and lessons. Rapid economic development also enables China to invest more in environmental education. Sustainable development has become one of China’s national strategies, and the concept of scientific development, resource conservation environment-friendly society, green growth, green GDP, ecological civilization are key and popular concepts. The ongoing Eighth Basic Education Curriculum Reform pays great attention to environmental education. These factors together have formed a good atmosphere for the development of environmental education providing meaningful learning opportunities for students (Yang, 2013). Our case studies show that using urban wetlands for the development of school-based environmental education is highly effective. Urban wetlands are an important part of contemporary urban ecosystems with important ecological functions to regulate urban microclimate and alleviate urban environmental pollution (Zhang et al. 2016). Learning with urban nature benefits students’ physical and mental development and improves their overall environmental awareness and satisfaction with school learning (Zhu, 2007). In addition, urban wetlands do meet city residents’ psychological needs to interact with nature and serve as leisure areas for local residents and tourists to learn history and as sites for school students to conduct research and undertake meaningful learning(Gu, 2012; Liu et al., 2013; Zhang, Lv, & Wang, 2007). Therefore, within the context of curriculum reform, using urban wetlands to develop school-based environmental education curriculum becomes a means for promoting students’ individual development, as shown in this chapter detailing two case studies from Beijing. However, the future development of environmental education in primary and secondary schools still faces enormous challenges. One of the questions worth exploring is that what kind of environmental education philosophy schools will hold. In respect of curriculum value orientation, the new curriculum reform is on the basis of humanistic ideas. Chinese education has been enduring a long time of focus on an excessive emphasize of intellectual achievement, manifested by exam scores, but often ignoring students’ moral development, manifested by students’ inner feelings, attitudes, and aesthetic ability, leading to unbalanced personal development with possible the loss of values and moral decay. The idea of humanistic education helps to reverse this situation (Wang, 2012). Together with “humanism,” anthropocentrism also plays an important role in Chinese education, which is deeply rooted in traditional Chinese values. In the light of social development stage, this anthropocentric tradition will not reverse in a very long term. Thus, “humanism” and “anthropocentrism” might still be two key points of ethics in environmental education of Chinese schools. Generally speaking, being integrated into the national curriculum signals that environmental education is an important part of basic education curriculum reform. Current experience shows that environmental education poses a challenge towards the traditional quality standard of teachers, teaching content, methods, and ideology and requires a thoroughly reform of school management systems, ideology, and pedagogy. Moreover, environmental education combines environment and sustainable development as a way to educate future citizens. It is not just a change of teaching content. Knowledge, skills, attitudes, and values are taught to students by teaching methods used through a more progressive educational process. Environmental education therefore will and must lead reform of traditional school teaching methods in China, including a much greater emphasis on partnerships (Knowlton Cockett, Dyment, Espinet, & Huang, 2017). The reform requires to change the relationship between teachers and students, and also advocates experiential learning, participatory learning, service learning, and learning within the context of society. These are all consistent with the idea of modern Chinese education reform. Therefore, environmental education will be further combined with the China education reform as indispensable in providing a source and power for reform. This research was supported by the Key Research Project of Beijing’s 13th five-years Plan of Education Science (CAJA16056). Ministry of Education. (1998). Education promotion plan of action for the 21st century. Retrieved from Beijing: http://www.moe.edu.cn/jyb_sjzl/moe_177/tnull_2487.html. 教育部. (1998). 面向21世纪教育振兴行动计划. Ministry of Education. (2001). Master plan of basic education curriculum reform (Trial). Retrieved from Beijing: http://www.gov.cn/gongbao/content/2002/content_61386.htm. 教育部. (2001). 基础教育课程改革纲要(试行). Ministry of Education. (2003a). Primary and secondary students’ environmental education syllabus. Retrieved from Beijing: http://www.moe.edu.cn/s78/A06/jcys_left/moe_706/s3320/201001/t20100128_81832.html. 教育部. (2003a). 中小学生环境教育专题教育大纲. Ministry of Education. (2003b). Guidelines for implementing environmental education in primary and secondary schools (Trial). Retrieved from Beijing: http://www.moe.gov.cn/srcsite/A06/s7053/200310/t20031013_181773.html. 教育部. (2003b). 中小学环境教育实施指南(试行). Ministry of Environmental Protection. (2016). National environmental education action plan (2016–2020). Retrieved from Beijing: http://www.zhb.gov.cn/gkml/hbb/bwj/201604/t20160418_335307.htm. 环境保护部. (2016). 全国环境宣传教育工作纲要(2016–2020)年.